I can't remember the last time I had this much fun making a quilt. Much of the fun was the anticipation of waiting for the directions for the next block on IG. It felt like Christmas morning each time one was revealed. I'm very happy with my color choices because it fits in with my home perfectly. I quilted it using a tight wavy stitch and the whole time I was sewing I felt like I was putting the frosting on a gingerbread house! It's such a happy quilt and will certainly help keep the gray winter days of Michigan at bay (at least for a little while!). I am so happy to have the quilt label all done and stitched on as well. 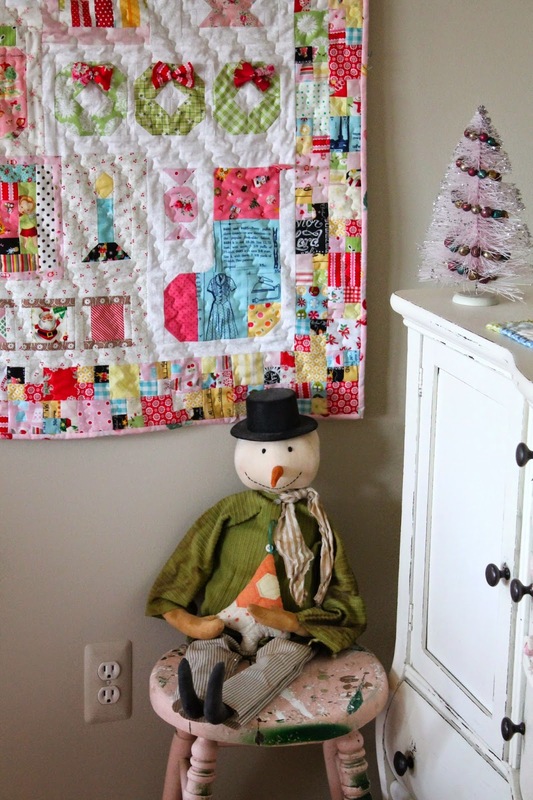 Lori is continuing the quilt along with a mini quilt of this snowman block and I can't wait to get started. 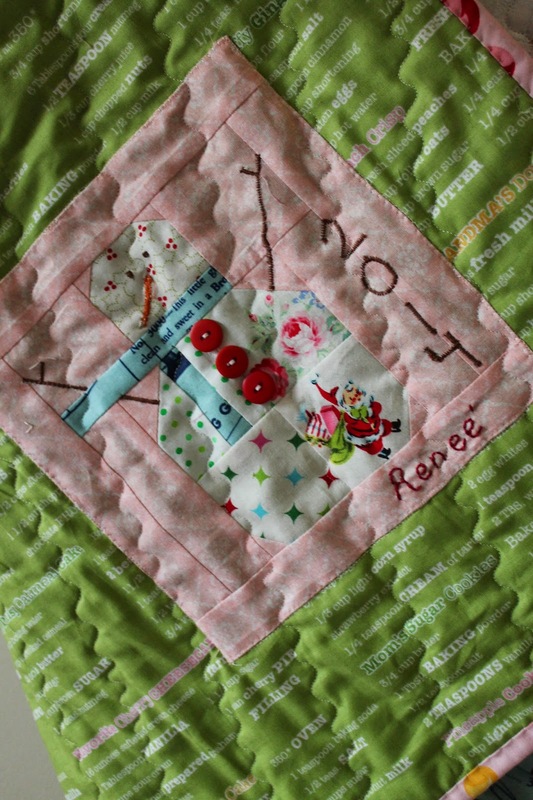 I want to take a moment to thank Lori for her generosity in hosting this quilt along. It is a lot of work to put one together and to photograph each step and upload to IG daily. Lori is a busy lady with a business and family and managed to keep us going with the quilt along all through Thanksgiving. I am so thankful for all that you do! Stunning, a real work of art. I love the colour choices. It's beautiful! I've been sewing along too, slowly but surely. 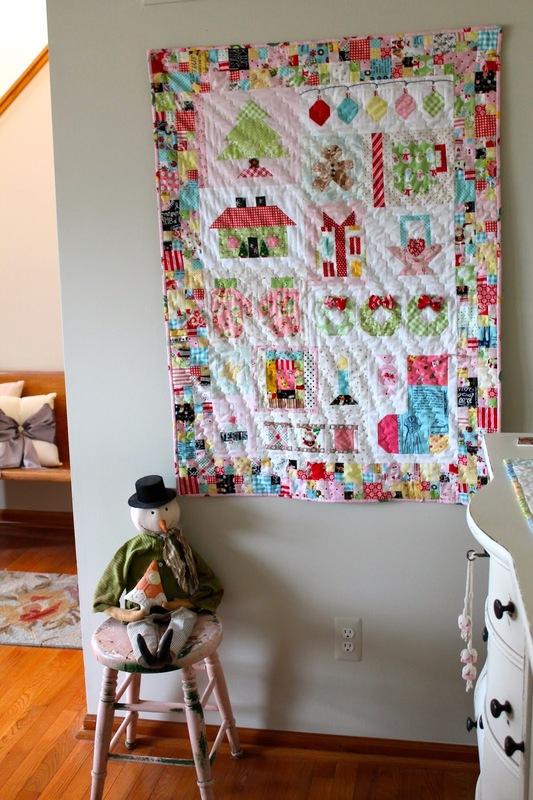 I love your colors and your quilting! Your quilt is adorable! I admire your tenacity. Renee your quilt is just gorgeous. This has been a fun quilt along. I am still trying to catch up. Your quilt is just so much happy fun! And you'll remember this quilt along every Christmas! I agree with you - it was so much fun to work on this and to see what everybody else was doing. Lori was very generous to do this for us. I'm a wee but envious that yours is quilted while mine is still a flimsy! 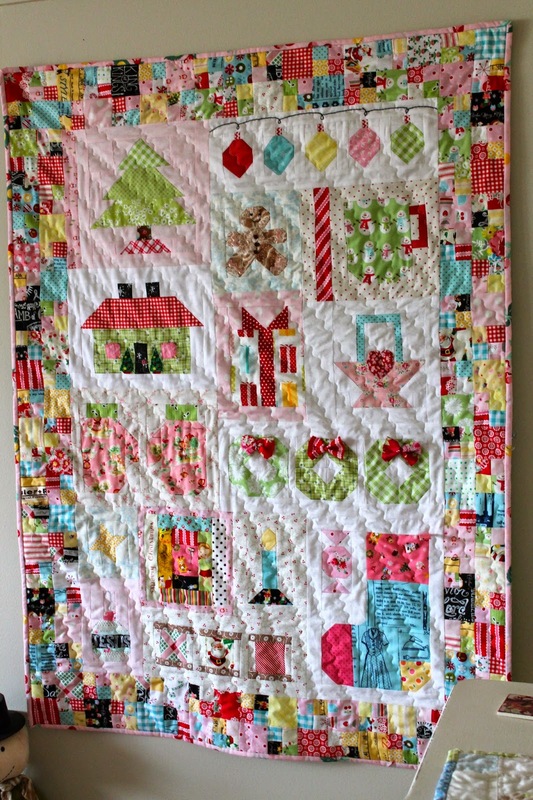 Your Christmas quilt is beautiful and I love the fabrics you used. I wasn't able to join in but love to see the finished projects.